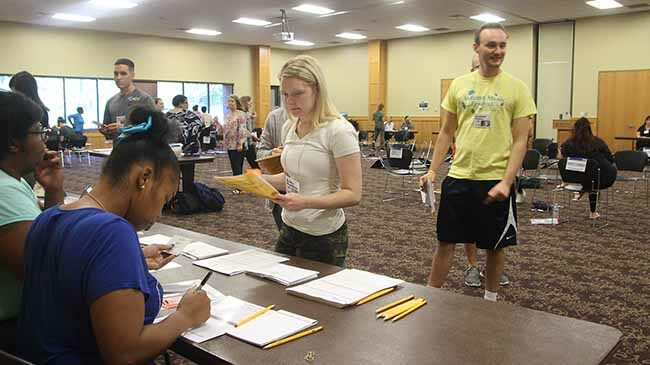 Senior nursing students Emily Hentz and Micah Napper (r) check in for work while Chris Kenny (l) looks on, during the poverty simulation. (NEW ALBANY, Ind. )—Nursing students recently took part in the first poverty simulation of 2018-19. Poverty simulations are facilitated group exercises designed to immerse learners in the world of the poor by placing them in the shoes of the disadvantaged and challenging them to walk a few miles in them. In the simulation, students play the roles of disadvantaged persons of varying ages, genders and ethnicities, trying to provide basic material well-being for their families, or simply to survive. In order to meet their needs, they interact with representatives of government agencies, utility companies, supermarkets and nonprofits. These representatives are played by volunteers from the New Albany Housing Authority (NAHA) with personal experience of being on the other side of the table. These volunteers also bring their perspectives to the group discussion that follows the simulation. Last week’s simulation was part of a project funded by a 2016 grant from the Community Foundation of Southern Indiana and a 2017 grant from the Horseshoe Foundation of Floyd County involving students from the Schools of Education, Nursing and Social Sciences. The simulations are embedded in the curriculum of these schools, making these exercises a unique confluence of high impact teaching practices, community engagement and service learning. Last year, 233 IU Southeast students participated in the simulations, developing skills, and an appreciation for socio-economic context, through immersion in lived experience. Myers and five other IU Southeast faculty members were trained as coordinators and facilitators as part of the grant, and work hard to stage four to five simulations per year. During the hour long simulation, the students go to work or school, deal with health and housing issues, shop for food, and try to navigate organizations and agencies to secure assistance. They deal with long bus rides to work and broken cars. Mostly they make decisions. Everything has a cost, and everything costs more than they have, so survival becomes a constant balancing act. That’s important in a region, and a nation, in which public-facing professions must be prepared to address the needs of the poor. According to the Office of Management and Budget, the average poverty threshold for a family of four was $24,257 in 2015. An estimated 47.7 million Americans, 15.5 percent of the population, meet this standard. The poverty rate in the IU Southeast service area was nearly 14 percent. Some segments are more affected. The poverty rate for children under the age of 18 was nearly 21.7 percent. After the simulation, students processed the experience in a discussion forum with the community participants. After a week, students will engage in a reflective writing exercise designed to elicit a deeper level of engagement.